Want to connect security cameras to TV and see live view directly from there? But if you are not prepared for a deep research on the subject of how to connect security cameras to TV and want to get it done with minimum effort, here is a shortcut for you. Note: This guide applies to IP cameras, which is the mainstream in video surveillance these days with much better clarity and much more smart features. Set up a security camera system and then you can connect security cameras to TV in a breeze! Step 1. Connect CCTV cameras to the NVR with Ethernet Cat 5/6 cables. Step 2. Connect the security camera NVR to TV with the HDMI cable. Step 3. Power the NVR with the power adapter. Step 4. Turn on the TV, and the live view will be shown on the screen. There is NO need to download an app, NO need to connect to a router, NO configuration or other things. And all accessories needed to connect security cameras to TV are included in the NVR system package. If you could hook up a security camera to TV with simple wiring, NO connection failure risks and NO extra cost, why bother to look for extra troubles? So get an NVR system directly is definitely the easiest way to connect security camera to TV! 4 pcs 5MP/4MP Security Cameras; 2TB HDD 8-Channel NVR for 24/7 Reliable Recording; Plug & Play; 2 Network Solutions. There are top 5 reasons you should choose an NVR system for security camera to TV connection. To connect security cameras to TV, you’ll need the help of either physical HDML cable connection or certain software which streams the camera feeds from elsewhere (PC or phone) to TV. After trying and testing all the possible methods suggested online by either users or professionals in the field, we’ve found 4 feasible ways to connect security camera to TV directly, and concluded that the NVR system is definitely the easiest and most reliable way to go! 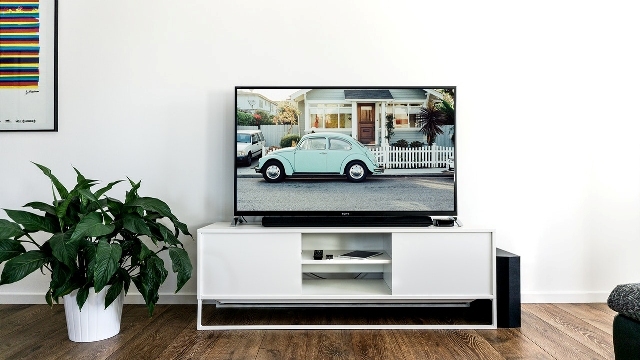 During our test, many other theoretically workable solutions may still fail to connect security cameras to TV due to the various settings of TV (LG, Samsung, or Apple TV) and camera models. SO it’s very likely that you may just get lost during the security camera to TV connection process. By contrast, you’ll never run into such trouble with NVR system to connect security cameras to TV. The large storage space is the biggest bonus of connecting a security camera system to TV. You don’t need to worry about the footages got overwritten soon. After connecting security camera to TV with NVR, you can not only watch the live but also save the moments that matter. For example, the Reolink RLK8-410B4 can record non-stop for weeks at 4MP super HD resolution. And you are free to choose lower resolution to record longer. 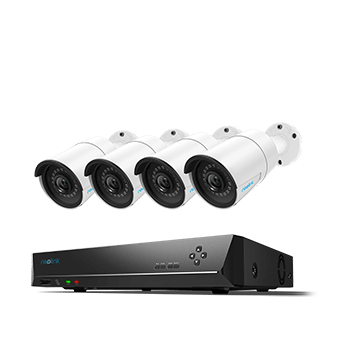 After you connect the security cameras to TV and NVR, the camera is ready to stream live, record and save to the network video recorder (NVR) – without router network! So you can avoid the IP camera configuration, a big headache for some, and get real protection with HD security camera recordings on hand. Have tried to connect security cameras to TV but got a “No Signal” warning in the end? This mostly happens when you connect security cameras to TV via the 3rd party software. Connecting CCTV camera to TV with NVR is nothing like that. Once you power all the counterparts up with right and easy wire connection, the live stream will appear on the screen with no signal loss. It’s easier to manipulate security cameras within a complete system. For example, after connecting security cameras to TV (and PC or other monitor), you could upgrade all IP cameras at a time easily via the NVR operation system. Find more specific steps on how to connect a security camera to TV and VCR here: How to View & Stream IP Cameras on TV. You will have to spend a lot of time working out a feasible way to go in your specific situation, and that might brings more trouble in the practice if you are not tech-savvy. One user in the forum complained that he only got a “no signal” message after hooking up his wireless security camera to TV, even though he bought the TV that is claimed to be compatible with his camera. With a security camera system, you can connect their support team whenever there is a problem and get detailed guidance to connect security cameras to TV. So it may come as a potential loss if you decide to run some 3rd party software for it. So if you decide to go with the security camera system method, here are the best picks for you to connect security cameras to TV in minutes. And they are highly affordable! Just set up a wireless system with easy-to-use WiFi cameras and an NVR. 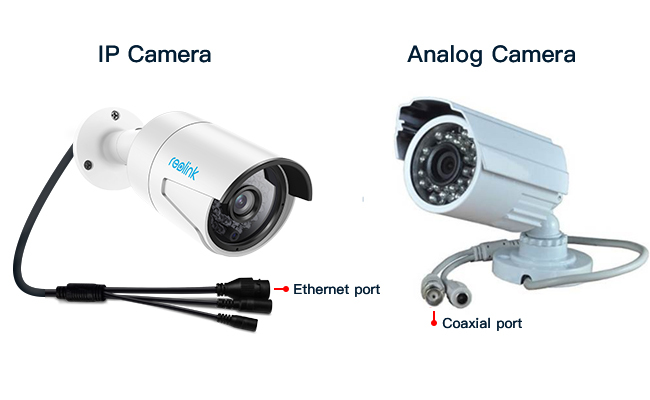 Good news is that the Reolink NVR works with the both Reolink wireless and PoE cameras, so you may mix and match the different security camera types. Want to go wireless but there is no Internet connection? The wireless security camera system will also work! The wireless cameras within the security system do not need WiFi to connect to and communicate with each other. They will build a private subnet between them to transmit data. Just power the NVR and cameras, and they will start to work. If you have discovered any workable ways to connect security cameras to TV, you are very welcome to share with us by commenting below! This entry was posted in How-to Guide and tagged connect security camera to tv, how to connect ip cameras to tv. The moment that guy in the video touched the window @2:54, he commited a felony. Did anyone call the police?